We are dedicated to providing your child with the highest quality dental care in a gentle, efficient and enthusiastic manner. Our goal is to help children learn how to keep their teeth healthy and beautiful for life so our emphasis is on prevention. We look forward to a long and mutually satisfying relationship. The manner in which we introduce our patients to dentistry will have a profound effect on their developing healthy life-long dental habits. 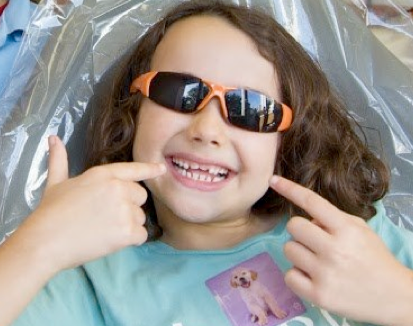 High quality pediatric dental care is characterized by careful use of x-rays, gentle but focused guidance in behavior management techniques and prevention of dental disease and malocclusions. We preserve tooth structure by small cavity preparations and avoid the removal of permanent teeth in orthodontic treatment whenever possible. We use sealants and early intervention of orthodontic problems as a means of promoting optimal dental health. We help our patients when emergency needs arise. We charge reasonable fees to diminish economic barriers to treatment. We provide a comprehensive range of services, including educational, preventive, restorative, surgical and limited orthodontic services for infants, children, and teenagers. We also provide additional services including hospital dentistry and the use of anti-anxiety agents. We treat many children with developmental differences both in our office and in the hospital. Special appointments may be scheduled. Payment for your initial visit is expected at the time of the appointment. Payment may be made by cash, check, or credit card. If you have dental insurance, please obtain your forms in advance, complete your portion and bring in forms (one for each child) and benefit booklet with you on your first visit. In case of shared custody, the parent who brings the child to the appointment is responsible for payment. If additional treatment is needed we will present an estimate of charges for these additional services and our office staff will be happy to work out the financial arrangements with you. Parking is plentiful on Ocean Avenue (2-hour limit) and alongside the office on Paloma Avenue (1-hour limit).